Healthcare institutions throughout the United States use a standardized color code system to communicate emergencies within the organization. Here are some examples of the color code system, which can differ from hospital to hospital depending on what state you are in. There was a Code Pink incident this January in Arizona where a new father smuggled his baby out of the hospital by placing the baby in a shopping bag and wrapping the baby in blankets. He first tried to exit through a locked fire door, and then walked out of the main entrance of the hospital, making it back to his home with the baby. The baby was retrieved by the police and placed under protective custody in the department of child safety. Interestingly, some of the most thorough news coverage was from DailyMail UK. Based on this incident, many hospitals in the Phoenix metro area staged their annual Code Pink drill this year with the scenario of a family member trying to remove a baby from the hospital using a shopping or tote bag, to test their staff response in the women�s and children�s units, as well as security response. Hospitals frequently use infant abduction protection systems like Hugs� or Cuddlesor MyChild�. These infant tag systems are designed to integrate with a hospital�s existing security technology and raise an alarm if the tag is altered or if the infant moves outside of the approved pre-set perimeter. HICSCenter.orghas developed an infant/child abduction scenario, including a planning guide, response guide, and incident command chart. The Hospital Incident Command System (HICS) differs slightly from �normal� ICS in that it is written for hospitals and includes components of continuing medical care in an emergency situation. Some of my favorite movies and TV shows have had baby stealing as a component of the story: Willow (1988), Labyrinth (1986), and Buffy the Vampire Slayer � Season 3, Episode 6: Band Candy (1998). Not sure what that says about my movie tastes. In Season 3, Episode 6 (Band Candy) of Buffy the Vampire Slayer (1998), the adults of Sunnydale start behaving like teenagers after ingesting magically modified chocolate candy bars sold by the students to raise money for the marching band to get new uniforms. Yes, I was in marching band. I played the clarinet. Yes, I also sold candy and wrapping paper and a host of other things to support the band. The adults have been more or less incapacitated by demons and vampires so that the leading baddie (the Mayor of Sunnydale) can complete a tribute to a local demon named Laconis. Laconis lives in the sewers and eats babies. Buffy and her team go to the hospital to see if any babies are missing, and the staff and parents are acting like unconcerned, self-absorbed teenagers, so much so that they didn�t notice four babies being taken. The babies are rescued by Buffy after the demon is defeated and returned to the hospital. The tribute of babies for the demon Laconis in "Band Candy" from Buffy S3 E6. Lesson learned? Chocolate can be used for evil. Labyrinth(1986) involves the Goblin King, Jareth, stealing the little brother of the main character, Sarah. Sarah is irritated that she�s been left home to babysit and that her little brother won�t stop crying. She wishes him away to a fantasy world ruled by Jareth and a cadre of muppet characters. Jareth sings a song about it that�s pretty awesome. Sarah has 13 hours to solve the labyrinth before Jareth turns her brother into a goblin. Sarah ends up saving her brother at the last minute and returns to the real world. The goblins from Labyrinth - image courtesy of muppet.wikia.com. Lesson learned? Puppets are awesome. In Willow (1988), the main character Willow has become responsible for a Daikini baby found by his children by the riverside. 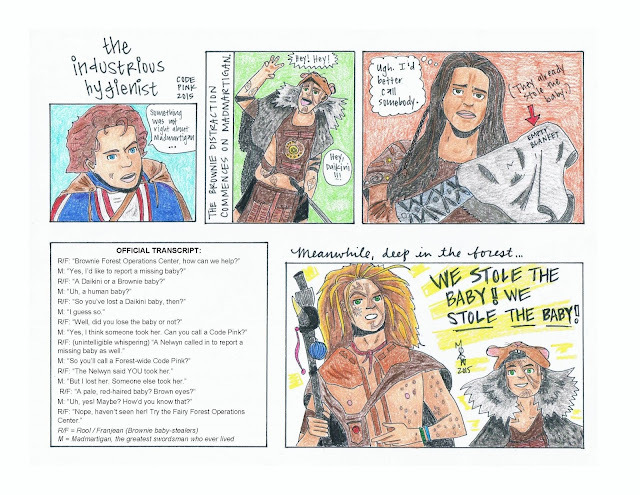 A member of the diminutive Nelwyn people, Willow gives the baby to a disgraced Daikini warrior, Madmartigan, after Madmartigan convinces Willow that taking care of the baby would give him a reason to live and turn his life around. Not long after they part ways, Willow is dismayed to discover that Madmartigan�s child care skills were, in a word, awful. 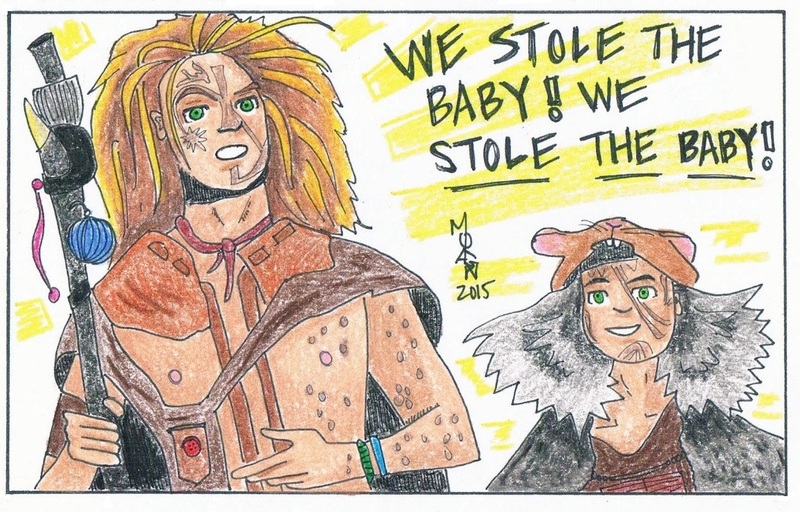 The baby, named Elora Danan, is whisked away from Madmartigan by a couple of brownies named Rool and Franjean. The brownies are working to save Elora Danan from being captured by an evil queen who wants to kill Elora to attain unmeasurable power. 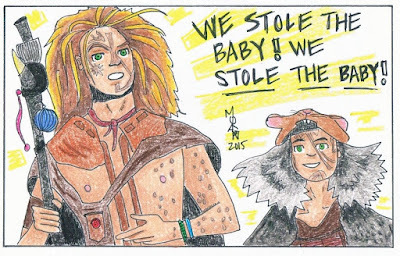 Willow and Madmartigan eventually team up with the brownies and lose/regain Elora Danan several times during the movie. Lesson learned? Don�t leave an infant with unqualified caregivers. And Madmartigan is the greatest swordsman that ever lived. To commemorate our Code Pink drill this year, I drew the following cartoon/manga of a possible Code Pink incident based on the events of Willow. Code Pink planning with Willow, Madmartigan, Rool, and Franjean. We're hard at work on our new Sock Puppet Safety videos and will share when they are completed. Thanks for your continued reading! Rool and Franjean steal Elora Danan from Madmartigan.